That was Secretary of State for Transport Chris Grayling’s response to Clive Betts (Labour, Sheffield South East), during a parliamentary debate on March 1. They were discussing the impending forced withdrawal of High Speed Trains from the Midland Main Line by December 31 2019. The HSTs must be withdrawn as they do not meet disability regulations that must be in place by the end of next year. 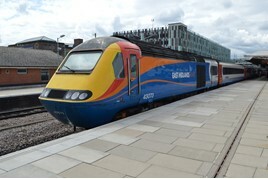 However, the replacement bi-mode trains are not due until 2022, which leaves a hiatus during which time the loss of eight eight-car and three six-car HSTs must be covered by the East Midlands franchise. There are currently no plans for this. Betts had asked if there was a plan for the HST power cars currently used by East Midlands Trains on the MML to be modified, to haul Mk 4 coaches made redundant by the introduction of Class 800/801 Azumas on the East Coast Main Line from November this year. Class 91/Mk 4 sets will be withdrawn from next year. For the full story, read RAIL 848, published on March 14, and available digitally on Android and iPad from March 10. Could the Class 43’s be used as freight locomotives and to be used as charter trains. Whilst some will be cascaded to Scotland and some to be kept as spares for other duties. Is the Transport Sec mad the hsts have years left in them. even the mk4 coaches its total madness. “I do not know what stories the Labour party has been listening to" and we don't know what stories Mr Graylings been listening to but the one about the 3 year gap with no HST's = 84coaches less to run the same service hasn't filtered through yet. Obviously they have a cunning plan yet to be unleashed, 12 car pacers anyone? Early 2020 does not correspond with withdrawal of HST Dec 2019. It never works like that. Living in a dream world. Have heard 2 HST power cars in for rework to use with Mk4 coaches.